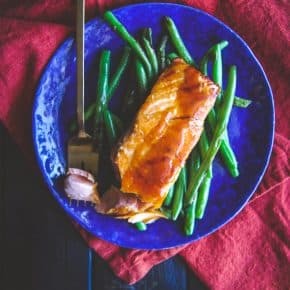 Looking for a super easy and delicious dinner? 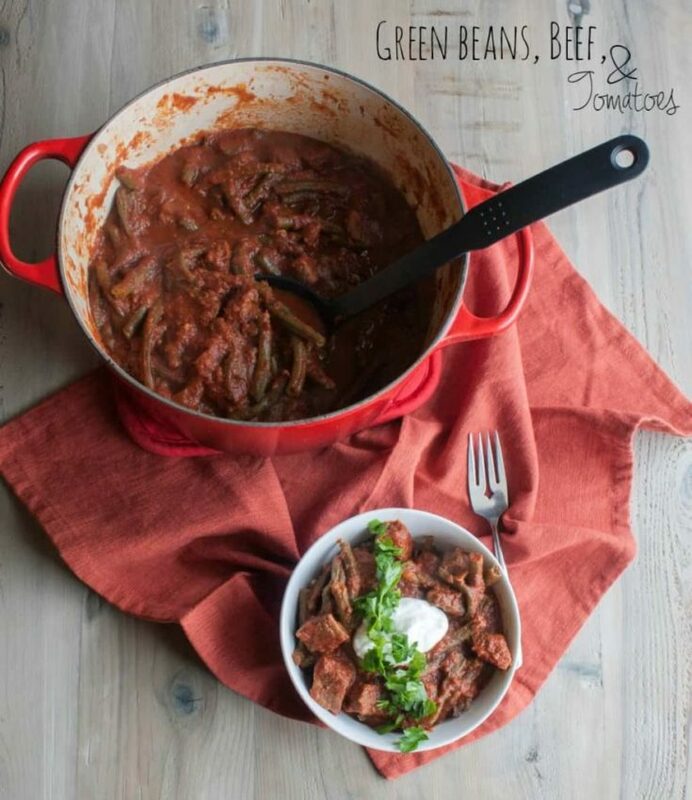 I’ve got you covered with this 5 ingredient green beans, beef and tomatoes, this week’s five ingredient Friday! I’m back in the kitchen after traveling (see my recommendations of 5 places to eat in Portland and my Taste15 experience overview here) and it feels so good! Green beans are in great abundance at the supermarket, at least they are here by me (in Wisconsin), and I know they’ll continue to be sold fresh at the farmers market throughout the summer months. I love having them as a side (like with this cheese and mushroom turkey meatloaf or this 5 ingredient pecan buttermilk chicken) or even just roasted with a little olive oil and garlic as a snack, but it wasn’t until I had Liz’s slow cooked Lebanese green beans and beef in Chicago at our ChiTownRetreat that I fell in love with them as a main ingredient for a meal and you all know I love Liz – she even guest posted for me and made this sweet and tangy slow cooker chicken while I was gone). 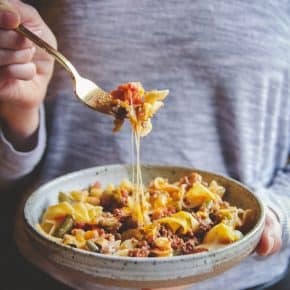 As soon as I got home from the retreat I made the recipe, and then I made it again, and then again, each time tweaking the recipe a little, until the last time I made it, I looked down and there were only five ingredients! You know how I love 5 ingredient recipes! And while I made this recipe using my slow cooker once, that kitchen appliance broke (no joke, a crack in the middle of it) so before I bought my new slow cooker (I just bought this one, it has cool claps on the side) and so I made this 5 ingredient green beans beef and tomatoes using my Le Creuset, I’m totally in love with it, I use it all the time for making dinners (like when I’m making the perfect pot roast or roasted chicken dinner with carrots and potatoes!) You start by cooking onions with a little olive oil, then brown some beef, add in green beans and pour in tomatoes, then let it simmer, all the flavors come together. It’s perfect to prep and set on the stove in the early afternoon, then have a wonderful dinner a few hours later. I like to serve the green beans beef and tomatoes as a dish by itself, but I’ve also served it over rice or pasta. Also, sometimes I top this with plain yogurt and parsley. It also works very well as a freezer meal, I just make a big batch, and then let it cool, then put it in a ziplock bag, label it, and then freeze it for another time. In a large pot with a lid, pour in olive oil and add chopped onion. Cook for 5 minutes until the onions become translucent. 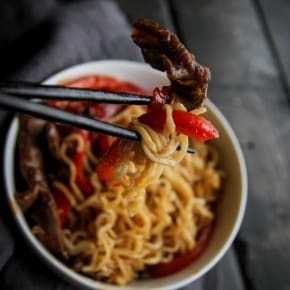 Sprinkle salt and pepper on the beef (you want to season the meat before you put it in the pot, I pat it onto the meat) and then add the beef into the pot and cook for 5 minutes, only stirring it once or twice so that the meat browns. Next add in the cut green beans and pour in the crushed tomatoes, stir, and put the lid on and turn heat to low and allow to simmer for 4 hours. As always, thank you for reading and for supporting the SweetPhi blog. This post contains an affiliate link, if you purchase amazon products through my store at no cost to you, I will earn a few pennies. All thoughts and opinions are as always mine alone. Happy cooking! This is such a beautiful summer stew Phi! Green beans are cooked with tomato-onions-garlic-olive oil-potatos-parsley and served with feta and bread throughout the summer here, it’s part of a category of dishes called Ladera/Lathera (veggies cooked in olive oil), that are essential in the Mediterranean diet. We are used to having them with chicken but for some reason we haven’t tried them with beef yet. So this recipe is a delicious way to try them this way! Regarding your photos…SO BEAUTIFUL! We love how you played with the shadows and the pot to create a rustic atmosphere. Ahhh!!! My Great Aunt Vieve would be so thrilled to see how you’ve adapted our family recipe!! Gorgeous photos Phi!!! Thank you so much Liz! Your great aunt Vieve had such a good recipe, after having your dish in Chicago it has become a favorite – your Lebanese rice pilaf is another fave we make all the time! Yay for green beans! I’ve been buying them every week lately. Love this dish – so simple and looks fantastic! Have a great weekend Phi! Green beans are pretty amazing, aren’t they? Thanks so much for the comment girl! Will make this this weekend, it looks so delicious with the green beans, and fresh ones at that. I love one-pot meals like this! It’s perfect for summer, and has just the right combination of healthy veggies, filling meat, and savory sauce. Can’t wait to try this one, Phi! I am with you on this, I love when a recipes has a few memorable ingredients. 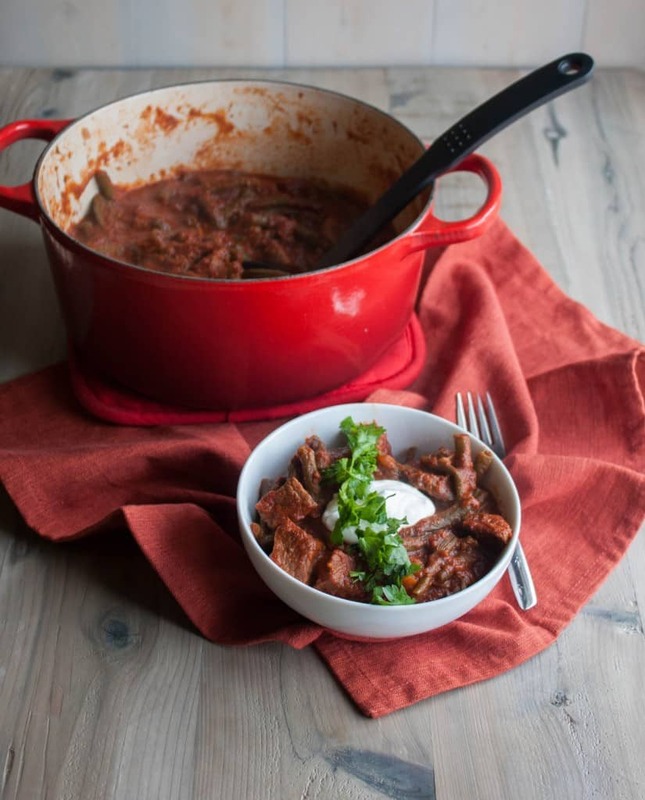 I am sorry about your slow cooker, but that great looking red Le Creuset is priceless.